DALLAS—Shen Yun Symphony Orchestra performed pieces both old and new with an enlightened spirit, said Mr. Scott Churchill, at the Morton H. Meyerson Symphony Center in Dallas Tuesday evening. “The blend of East and West is great,” said Mr. Churchill, a University of Dallas psychology professor and senior media critic for the USA Film Festival. The selection of pieces Shen Yun Symphony Orchestra performed includes classical pieces by the likes of Tchaikovsky as well as with original compositions like “Creation” by Jing Xian. Mr. Churchill said he was also impressed by the themes he saw in the original pieces like “Creation,” and how effectively the compositions came through in short pieces. “I think they’re beautiful. I think they’re short and sweet, and they deal with the divine and the heavenly,” Mr. Churchill said. Mr. Churchill attended the performance with Ms. Elle Schuster, an artist whose photo-illustrations have graced the cover of magazines like TIME. “They were great. I thought they were excellent,” Ms. Schuster said. 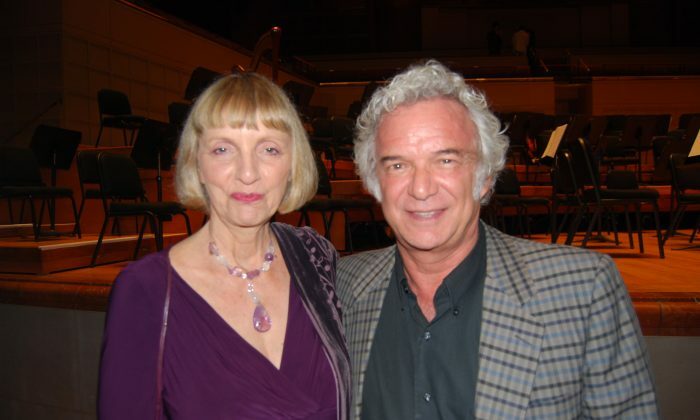 Paul and Phyllis Peterson were in the audience to take in Shen Yun Symphony Orchestra at the Morton H. Meyerson Symphony Center in Dallas Tuesday evening.